The clerk reads the charges and asks the defendant how he or she pleads. Usually, it’s “guilty”—but with an explanation, the plea often being entered by the deputy public defender. The lawyer then generally retreats to the background while his client, standing in the “well,” addresses the court. There’s no prosecutor; there are no private attorneys. The judge, played by actor Jay Jostyn, hears unsworn testimony and imposes a sentence. Or not. If the crime doesn’t seem all that serious—such as a woman who ranted at the screen in a theater during the showing of a Humphrey Bogart flick because the girl friend Bogie abused kept coming back for more—the jurist will simply dismiss the charge. 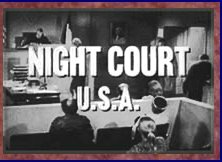 judge on "Night Court, U.S.A."
If the defendant pleads “not guilty,” that means probably there will be a trial, but the judge listens to what the defendant wants to say. Unless inclined to dispose of the matter with leniency, he orders the accused misdemeanant into custody to await his or her day in court. Sheepish and haltering, she proclaims embarassment over the incident, and the deputy public defender (played by Barney Biro) comes forth to assure her: “Miss Wilton, suppose you tell his honor the story just as you told it to me and I’m sure he won’t keep you much longer.” He returns to his seat. The defendant explains that she long ago resolved herself to the fact that she was not attractive. She had “never had a real date”—that is, not until “George” came along. That afternoon, George, unable to find a parking space, dropped her off at a department store to purchase her trousseau, expecting to join her after coming upon a place to leave his vehicle. She tried on garments and, with the store about to close, threw her coat over those garments and headed out to find George to get the money to pay for them. But, alas, the store detective stopped her, and she was arrested. She is about to be released, it appears. To the contrary, the judge goes on to tell Wilton: “You still tell it beautifully.” He reflects that about 10 or 12 years earlier, he heard her relate the same tale. Do you suppose these episodes will be shown at the Judges’ College in Berkeley as training films?